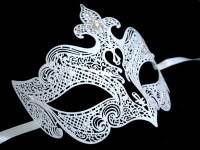 White satin fabric covered base with clear crystal detailing...Stunning Venetian masquerade mask! 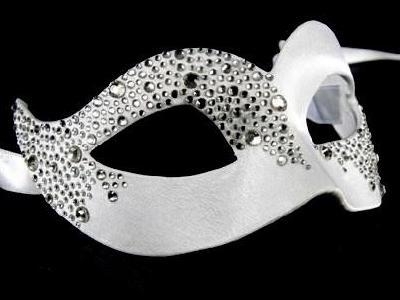 White satin fabric covered base with beautiful clear crystal detailing....What a ladies masquerade mask this is!!! With traditional white satin ties for a comfortable fit the masquerade mask is perfect for your next masquerade party, Venetian masked ball or wedding/prom party. All masks are hand made in Venice. No two masks are ever identical. Patterns will vary on each mask.